Simon Smith-Wood moved from the UK to Germany in 2003, and has been living and working in Düsseldorf since then. 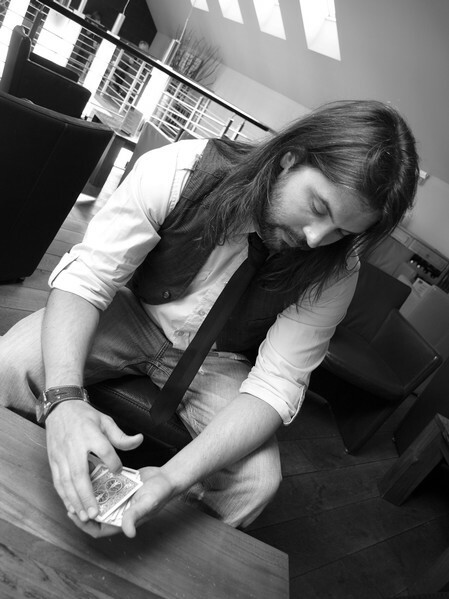 He has been studying and performing magic for many years, both as a hobby and at a semi-professional level. Simon has performed in front of all kinds of audiences, in a wide range of settings - from pleasing the public on the streets, to baffling guests at birthday parties, and from shocking crowds at corporate events, to amazing audiences at charity functions. Simon's unique blend of close-up magic combines classical sleight of hand and psychological illusion with contemporary delivery and an interactive approach, where the magic happens right in front of the spectator's eyes (and sometimes even in their own hands)! Simon can be booked for events across Germany and the UK. Utilising the services of a close-up magician is a fantastic way of amusing and impressing your guests, whatever kind of function you are planning, and is guaranteed to ensure an entertaining and memorable occasion. Simon's table and mix-and-mingle magic are ideally suited to weddings, birthday parties, engagement or anniversary parties, Christmas parties, balls and proms, house and garden parties, and corporate events. If you would like to learn more about what Simon could add to your forthcoming function, and to view testimonials from past clients, please visit the events pages or the testimonials page. To see Simon in action, you can browse the gallery. If you have any questions or queries, or would like to book Simon's services for your next event, please link to the contact page.